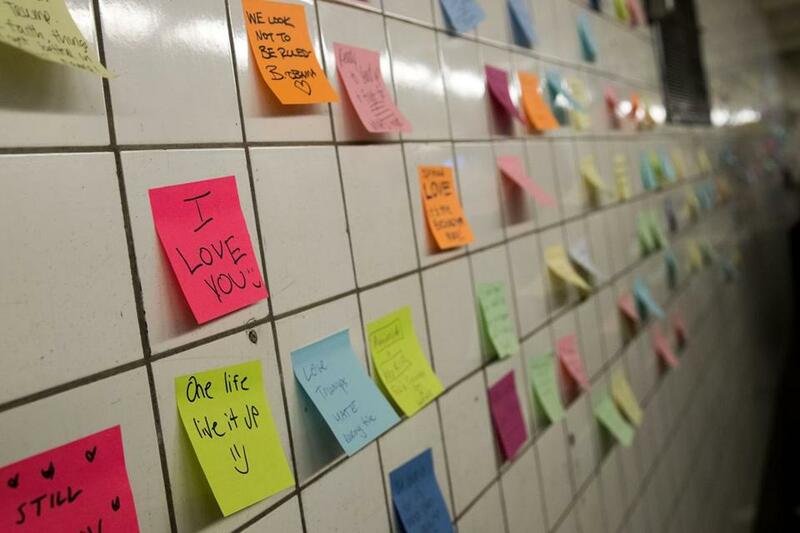 Notes, many with politically themed messages, hang on a wall at the 6th Avenue subway station. Given the current political climate, uncertainty about the country’s future under president-elect Donald J. Trump, and what she calls a desperate need for positivity, Venita Subramanian has invited people to come together Friday night to write messages of hope on Post-It notes, and then stick them to a subway station wall for all to enjoy. Subramanian sees the project, which she calls “Subway Therapy Boston,” as a way to move past the negativity stemming from the presidential election, and to rally the community. Her idea was inspired by a similar project that took shape Wednesday in New York City’s Sixth Avenue station at 14th Street. According to the New York Times, street artist Matthew Chavez brought sticky notes and pens to the station, encouraged people to spill their guts, and then told them to slap the small notes on the wall. By the end, 2,000 colorful paper squares marked the white-tiled walls. Subramanian’s event will begin at 9 p.m., at the MBTA’s Park Street station. She created a Facebook group where updates about the precise location will be shared. Sticky notes and pens will be provided, but volunteers are welcome to bring more, she said. Subramanian, who is originally from the United Arab Emirates and here on a green card, has not been in touch with MBTA officials about the guerilla art project. But she plans to stay and clean up the notes at the end of the night. She will also take photos of the collage as it grows, and share the images to Facebook.